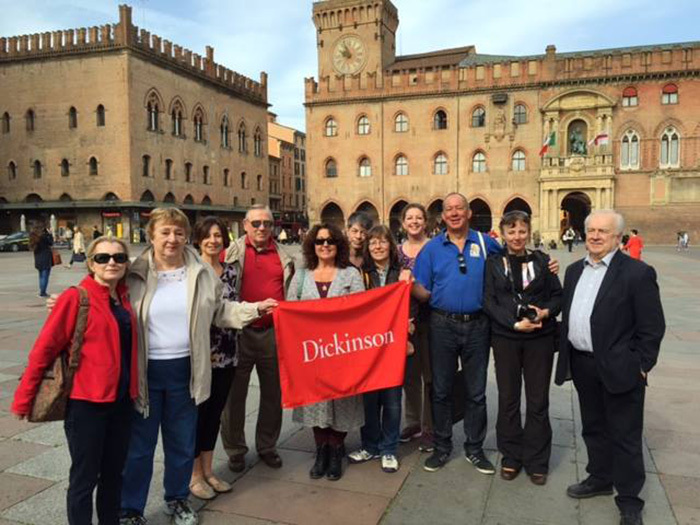 Alumni, faculty, staff and friends of the college gathered in Bologna, Italy, to celebrate the 50th anniversary of Dickinson's study abroad program. The 2015-16 academic year marked the 50th anniversary of Dickinson’s flagship Bologna program, as well as the 30th anniversaries of the college’s offerings in Bremen, Norwich and Moscow. As the spring semester comes to a close, we pause to reflect on the ways Dickinson alumni, faculty, students and staff came together to celebrate half a century of global education. Nearly 500 Dickinsonians attended a two-day event in Washington, D.C., that included a grand reception; globally themed lectures, workshops and exhibitions led by faculty, study abroad alumni and special guests; and dinners for alumni of Dickinson’s Bremen, Cameroon, Malaga, Norwich, Toulouse and Moscow programs. Many more took part in the One College One Community program, a yearlong series of conversations and panel discussions around a given theme. Throughout the fall events centered on the causes and consequences of living in a global community and included sessions on Dickinson’s Mosaic programs, international security, ethnomusicology and community-based international health. The celebrations concluded in the spot where Dickinson's global education programs began. Held April 12-14, the Alumni Global Adventures Trip brought more than 70 alumni, students, faculty and friends of the college together in beautiful Bologna, home to Europe's oldest university and Dickinson’s first study abroad center. Simona Lembi, president of the Bologna City Council, welcomed the visitors on behalf of the city, and Alessandra Scagliarini, dean of international relations at the University of Bologna, spoke about the long relationship between Dickinson and the historic Italian university. The weekend also included lectures and classes in art history, basic Italian, ethics and international security; a formal reception; tastings of local wines and balsamic vinegars; and a lecture on migration and security studies by Soren Jessen-Petersen, an expert in the field and former assistant to the U.N. secretary general. For former Bologna study abroad students and program directors, the Bologna getaway offered a chance to reconnect with friends, revisit old stomping grounds and learn something new. And, as with all of the celebration-year events, it presented all attendees with a taste of the rich cultural, educational and service opportunities available to Dickinson’s study abroad students, then and now.